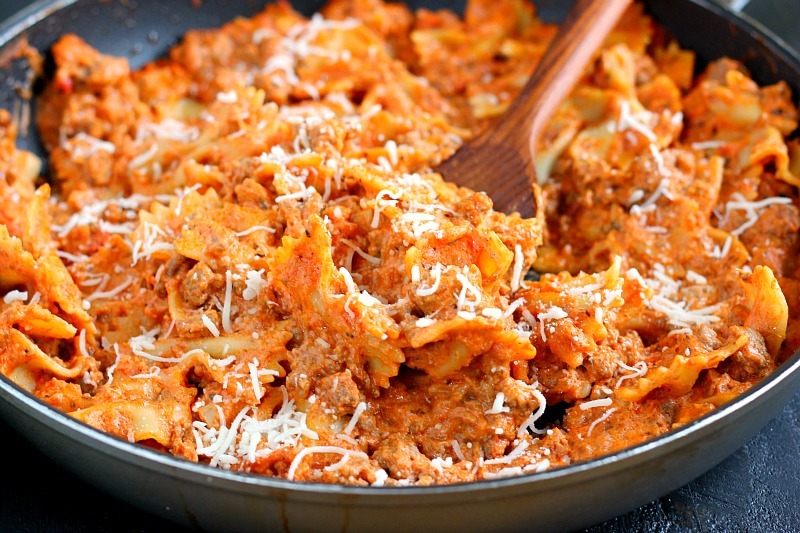 This Creamy Bowtie Lasagna is an easy dish that the whole family will enjoy. Filled with hearty ingredients and made in a skillet, this pasta contains all of the flavors of classic lasagna, but without all of the prep work! We’re less than two weeks away from Christmas! Can you believe it? I’m starting to kick it into high gear by finishing my shopping, wrapping presents (actually, the hubster does that), and putting the finishing touches on my holiday dessert list. Even though I don’t host Christmas Eve or Christmas Day festivities, I like to come fully prepared with some delicious goodies to share. After all, my family kind of expects that since I’m a food blogger, so I’m making sure to include these cookies and those donuts. And in between the hustle and bustle of the holiday season comes those every day tasks that just need to get done. Like cleaning, laundry, and making dinner. I’m always on the hunt for easy, yet creative dinners to make. 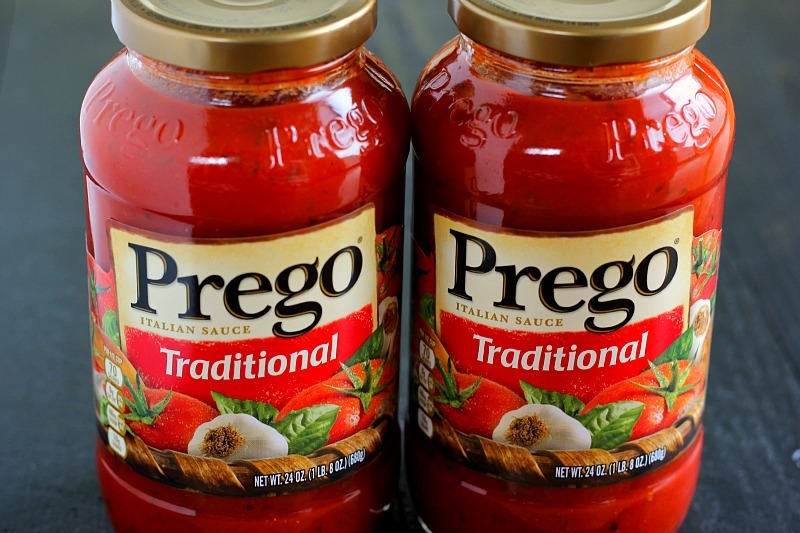 So when I was shopping at Walmart last week, I stumbled across Prego® Traditional Italian Sauce. This is my favorite pasta sauce, as it tastes homemade and is filled with flavor. Prego® is rooted in Italian American heritage, so it combines the perfect balance of a sweet and savory flavor. It’s also perfect for the hubster and I, as it’s a comforting and delicious sauce. So naturally, I just had to stock up on one (or three jars) of Prego® Traditional Italian Sauce. I had the perfect holiday recipe in mind and couldn’t wait to test it out. If you’ve been hanging around here long enough, then you know that I’m all about the easy recipes. I’m happy to report that this Creamy Bowtie Lasagna is perfect for a weeknight or holiday dinner. It’s simple to make and full of flavor. It’ll definitely please the pickiest of eaters and will be a true holiday favorite. 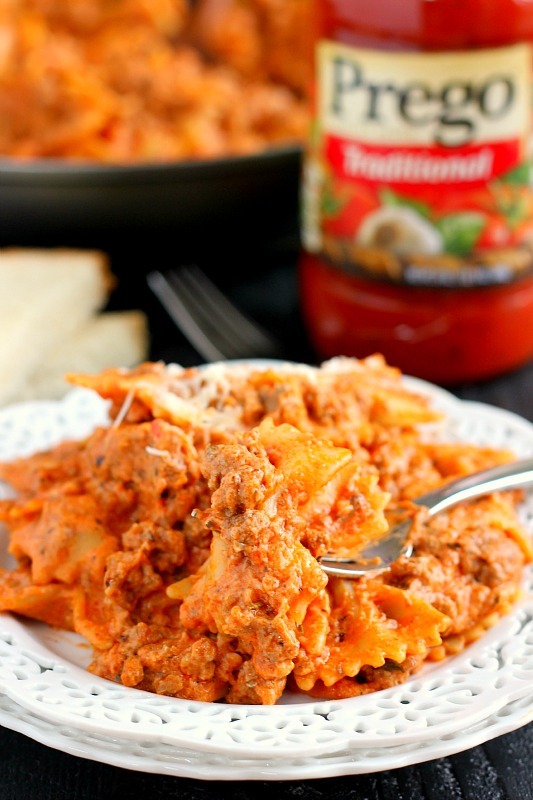 By using Prego® Traditional Italian Sauce, ground beef, bowtie noodles, sour cream and spices, this cozy dish is ready with minimal prep work, but with all of the classic lasagna flavor. And did I mention that this Creamy Bowtie Lasagna is so simple to prepare? You’ll start out by browning the ground beef and cooking the noodles. 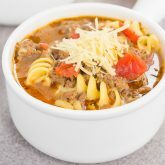 After the noodles are cooked, add in the Prego® Traditional Italian Sauce, ground beef, sour cream and spices. Fold it all together, top with some mozzarella cheese, and your dinner is ready to be devoured. This Creamy Bowtie Lasagna is hearty, comforting, and just the dish to serve for your next holiday get-together or weeknight dinner. With simple ingredients and a robust taste, you’ll be making this dish over and over again! Looking for more recipe favorites? I’ve got you covered! In a large skillet, brown ground beef. Drain, cook, and crumble. Set aside. While ground beef is browning, boil noodles according to packaged directions until al dente. Drain noodles and then toss with olive oil to prevent from sticking. Set aside. Add spaghetti sauce, garlic powder, Italian seasoning, salt and pepper to ground beef. Mix well, cover, and let simmer for about 5 minutes. Remove cover, add in noodles, sour cream and cheese. Fold together and let cheese melt slightly. I have an intense nostalgic love of bowtie noodles, which my grandmother cooked with. I just think they taste better than all the noodles! This is such a great idea! Good luck with everything, Erin! :) And thanks for the lasagna love! This looks absolutely perfect, Gayle! 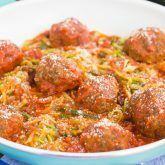 Anything with pasta and marinara sauce is an automatic hit with my boys, and I appreciate easy recipes like this one (especially at this busy time of year). Pinned! 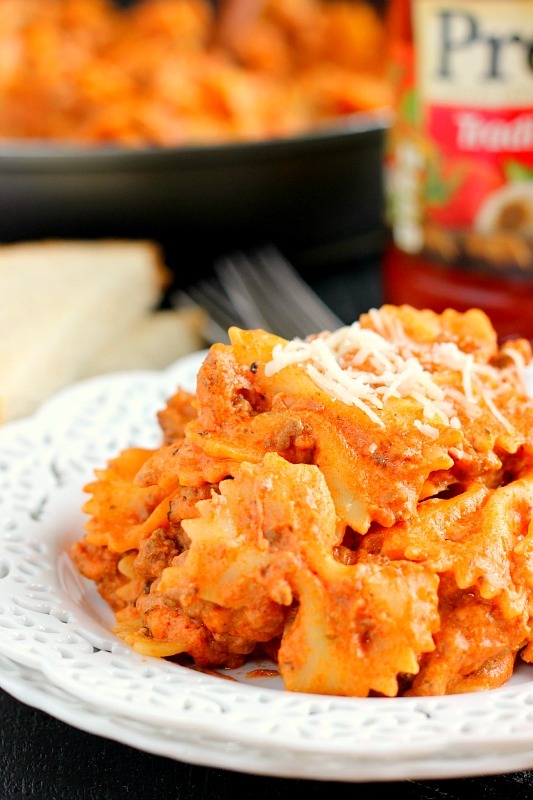 There's just something about pasta and marinara sauce that's an instant winner with everyone...even my husband! :) Thanks, Blair! Thank you for the kind words, Catherine! This dish makes the tastiest dinner on busy weeknights! Yep, this is a winner in my book! Anything pasta...anytime...anywhere...Done! Love it, Gayle! Now this is comfort food Gayle! Creamy pasta dishes are my weakness and this looks like something I would eat up in seconds. Yes! It's the ultimate comfort food! Thanks, Dannii! This is what winter comfort food looks like! This is such a wonderful weeknight meal! I love pasta dishes like this! 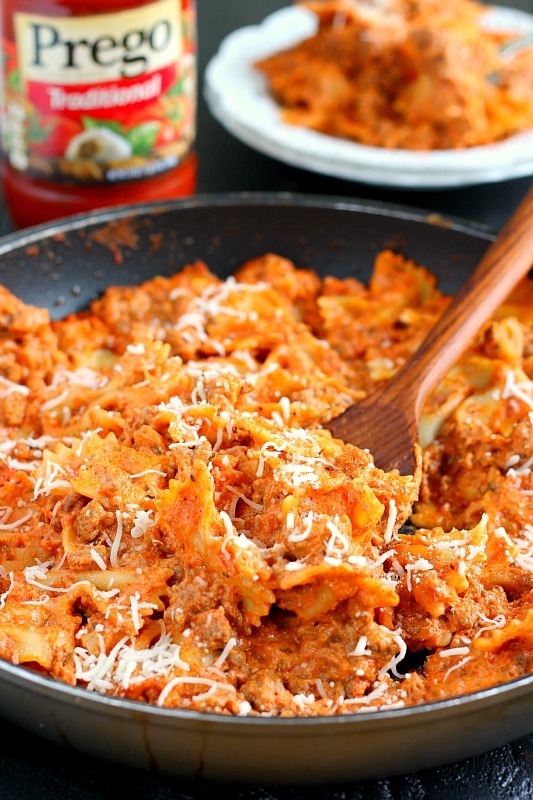 I love this quick skillet lasagna, Gayle! This is the perfect dinner to put together on the fly amidst all the Christmas craziness! Definitely, Marcie! Thanks for the kind words! We are trying to finish up all of our holiday errands too. Can't believe we only have 10 more days! This lasagna is perfect during this busy season! Love how easy it comes together! I love easy dinners like this one! Haven't made lasagna in a while and this recipe sounds so easy to make! Pinned to try it! Thanks, Mira! I hope you like this if you try it! I am really sad that Christmas is already next week, is that strange? I just love this season so much and hate when it is over.But what I do need is more easy dinners so I can finish all my wrapping. This looks delicious Gayle! I'm sad, too! I always look forward to everything leading up to Christmas, and then it's over way too fast. Thanks for the kind words, Mariah! 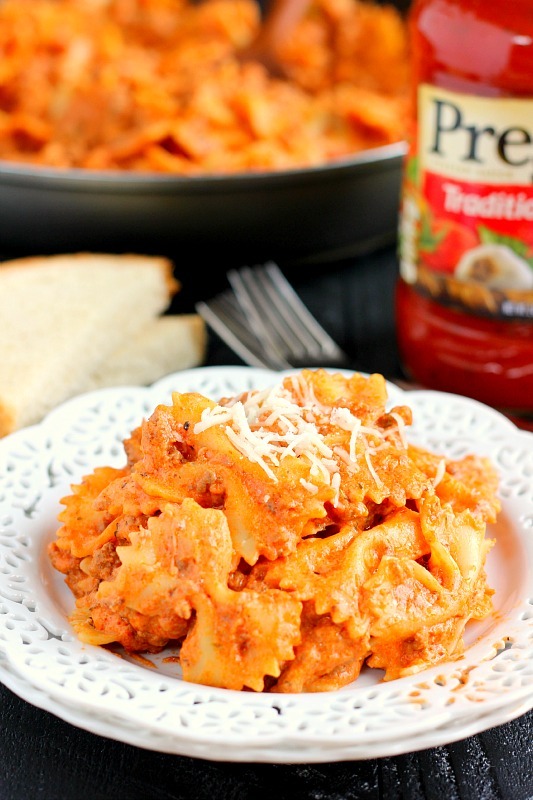 I used to love Prego pasta sauce and haven't used it in a long time. What a quick and easy recipe to whip up on weekdays. Looks good and I like the use of sour cream. Thanks, Neeli! It's perfect for those busy weeknights! Family loved. Do u think u could sub sour cream for ricotta? I'm so glad your family loved this, Jess! I've never tried this pasta with ricotta before, but I definitely think it could work. Please let me know how it turned out if you do try that! Have just discovered this on Pinterest. I converted the recipe to UK equivalents and then halved it as there is only 2 of us. Oh my word it was delicious!! Very filling too. Will be making this again for sure. Hi Heather! Thanks so much for stopping by and letting me know how it turned out! So glad you liked it (it's one of my favorite meals), and that's a great idea to halve it! My son told me to add this to our list! So good! Hi Autumn! I'm so glad you liked this! It's a favorite of mine, too. In fact, it's on my dinner menu for next week! :) Thanks so much for stopping by! I absolutely love this recipe! I do have a very picky man that doesn't like ground beef. So instead I put mushrooms in and it was delicious! Thank you!! I'm so glad that you liked this recipe, Maria! Mushrooms sound like a wonderful substitute for ground beef. Thanks for letting me know how it turned out! I love this recipe because it's such a homey weekday dinner. Also, it comes close to the taste of lasagne without all the extra effort and time. It's a thousand times better than any ready to eat lasagne you can buy. 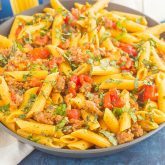 I've tried this recipe with different tomato sauces and it's worth to expirement and find a sauce or combination of sauces that you really like because it makes this recipe. So, thank you for a great recipe that seems to become one of my staples for when I need leftovers. I'm so glad to hear that, Sarah! It's a favorite of mine too. Thanks so much for stopping by and letting me know how it turned out!